PhySIC: a veto supertree method with desirable properties. Ranwez V., Berry V., Criscuolo A., Fabre P.H., Guillemot S., Scornavacca C., Douzery E.J.P. Please cite THIS paper if you use PhySIC. It is a web form that you fill with your data and values for the program options, your name and the country where you are; then click on the "Execute & email results" button to start the program with your settings; after a while you will receive your results by email. For a quick start, simply select the "Example" radio button, type your email, and click the "Execute & email results" button. This will run the program with default values; the example tree file contains three trees in Newick format. 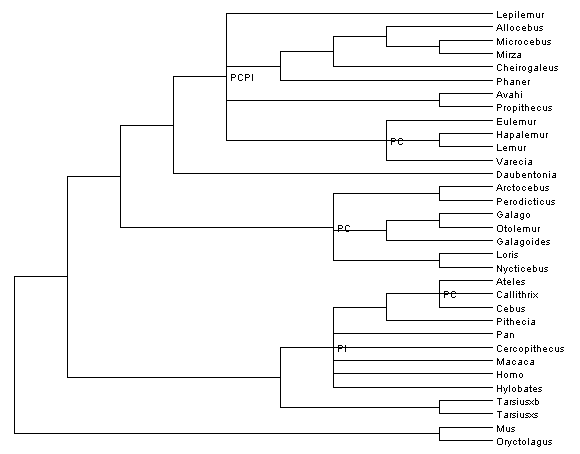 You have the possibility to study a supertree already inferred by another method (MRP, etc) to know which clades would collapse according to the PI & PC properties. This enables to detect dubious clades such as novel clades not supported by the input trees (thanks to PI) or even contradicting input trees (thanks to PC). If you use this option, Physic does not infer a supertree by itself, but instead collapses nodes of the given supertree that do not respect PI and/or PC, tagging the resulting multifurcations accordingly, ie by PI and/or PC labels. Before computing the supertree, the program first collapses source tree branches having a bootstrap proportion (bp) lower than the indicated threshold. Hence, only significantly supported clades are considered for supertree building (this is especially important with veto supertree methods). 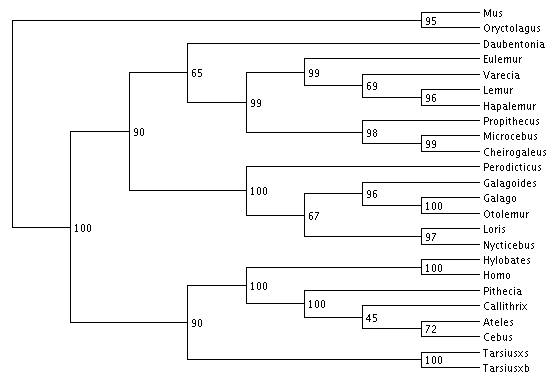 For instance, if bps range from 1 to 100 in the source trees (as in the above example), you can typically use 70 as a clade selection threshold. Source trees that do not contain bp are not affected by this collapsing step. Thus, the input file can contain a mix of trees with bps and trees without. Note that trees with only some bp missing, are not considered by the collapsing step. If you do not want the program to collapse branches at all, just set the treshold value to 0. The outputted supertree contains labels (either PI, PC or PIPC) indicating the reason for each multifurcating node. These labels can be seen with usual tree viewing/editing softwares such as TreeDyn, Treeview X or DendroScope. Mainly, PI indicates unsufficient overlap between the source trees to choose any possible resolution of the node; PC indicates that any further resolution of the node would contradict at least one source tree; PIPC is a combination of both phenomena, ie resolving further the node would result in either arbitrary branches or branches contradicting some soure tree(s) (see the paper for details). To obtain a supertree as resolved as possible (under the constraints of the algorithm), as a rule, if you obtain mainly PC labels, try to increase the threshold, and if you obtain mainly PI labels, try to decrease the threshold.